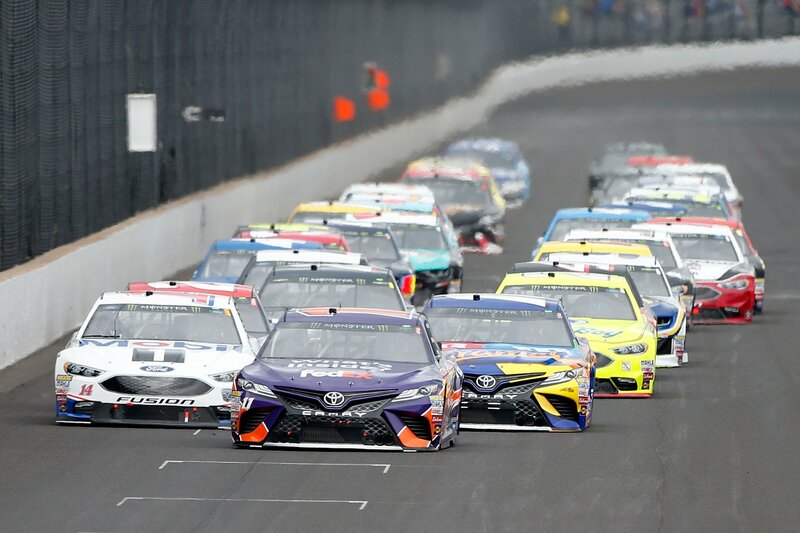 View full 2018 NASCAR Indianapolis race results below. Kyle Busch and Kevin Harvick will lead the field to the starting line. This will be the first time the MENCS has taken to the track all weekend. Every session prior was rained out, that’s the first time in history. 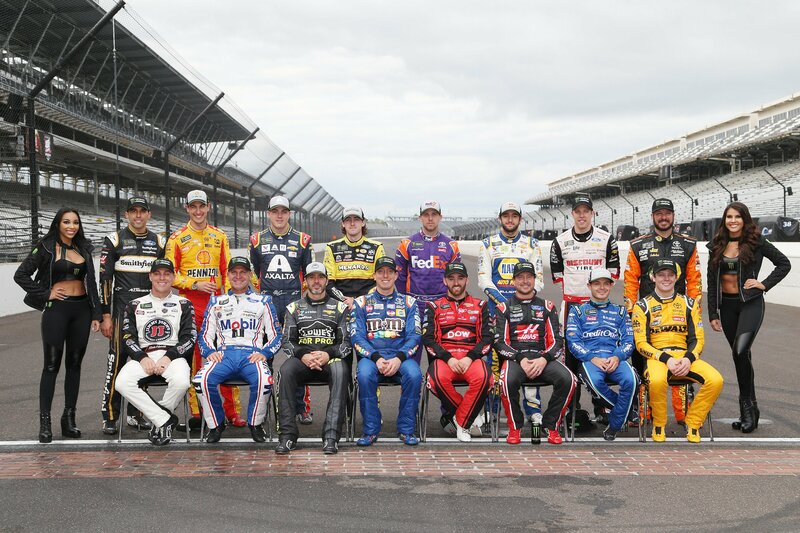 It’s a 160 lap event around IMS and they’re ready for the green. Green flag, Kyle Busch gets the jump on the outside line. He heads to the bottom just ahead of Harvick into turn one. Busch leads by several car lengths off turn two. Lap 10, Kevin Harvick heads for the pit lane from 2nd place. Kyle Busch wanted to come but he missed the pit entry. Lap 11, the competition caution is out. Penalty to Kevin Harvick, the crew had an uncontrolled tire. The rest of the field heads for the pit lane. Two tires for Kyle Busch, he leads them off the pit lane. Denny Hamlin and Clint Bowyer stayed out. Green, Hamlin leads into turn one. Kurt Busch pokes through Clint Bowyer to take 2nd. Lap 21, Hamlin leads by about a second. Clint Bowyer is all over Kyle Busch for 2nd. Lap 30, Clint Bowyer gets a run off turn four. He looks to the inside of Busch and takes over 2nd into turn one. Kurt Busch and Kevin Harvick head to the pit lane. The second competition caution is out. The field heads for the pit lane. Boyer and Keselowski are off first with two tires. Kyle Busch is off in 5th, he’s the first car with four tires. Busch and Bowyer lead them to the restart. Green, they’re even into turn one. Kurt Busch takes the lead on the outside off turn two. Lap 39, Denny Hamlin and Kyle Busch are working through the field in tandem. They’ve climbed to 4th and 5th. Lap 42, Truex has mechanical issues under the hood. The hood has buckled an he heads to the garage area. The caution is out. The back half of the field heads for the pit lane. Green, Bowyer gets a huge push from Hamlin on the inside. Hamlin pulls out and looks to the inside. Kurt Busch noses ahead on the outside. Bowyer fights back and hold it off turn two. Clint Bowyer holds them off to win stage one at Indianapolis Motor Speedway! The field heads for their pit boxes. Ryan Blaney is first to the pit exit with two tires. Green, Kyle Busch leads by two car lengths into turn one. Bowyer fights with Menard for 2nd. Bowyer takes the runner-up position and sets sights on the leader. Lap 57, Bowyer is all over the bumper of the leader. Lap after lap he pokes his nose to the inside on corner entry. Busch holds him off. Lap 59, Bubba Wallace is in the wall. He slides across the track and David Starr is left with nowhere to go, he plows into the left rear of Wallace. The #43 lost brakes yet again. Green, Kyle Busch leads. Kevin Harvick moves to 2nd. Lap 67, big crash off turn two. Allmendinger got loose under Bowman. He slid up the track and pushed them both into the outside wall. Allmendinger then made heavy contact with the inside wall. Kyle Busch heads to the pit lane. Most of the field stayed out. Green, Byron struggles on the restart. He spun his tires and falls to 4th. Kevin Harvick leads Bowyer on the bottom. Lap 77, JJ Yeley is around off turn two. The caution is out. Green, Harvick leads on the bottom into turn one. Jimmie Johnson, Austin Dillon and Paul Menard run three wide deep in the field. Johnson came up and clipped the left front of Dillon. They all continue but Dillon lifted and lost a bunch of positions as the field drove by on the inside. Lap 90, Kevin Harvick heads for the pit lane. He wasn’t going to make it to the end of the stage on fuel. He passes the lead to Clint Bowyer. The #14 is in fuel saving mode. 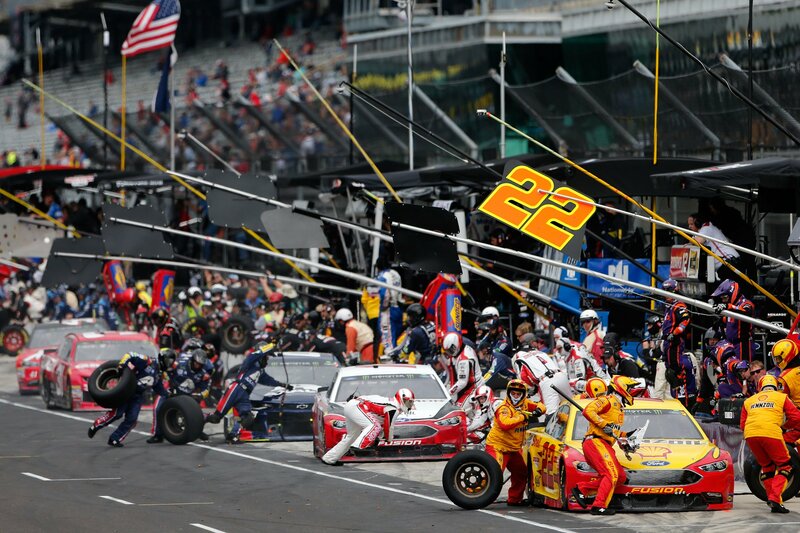 3 to go in stage two, Clint Bowyer, Denny Hamlin and many others head for the pit lane. Aric Almirola was caught speeding the lap before. Matt Kenseth is handed the lead. Kyle Busch has been handed a penalty. He pitted too soon. Pit road was closed as he reached the commitment line. Matt Kenseth leads the field to the pit lane. Chase Elliott wins the race off the pit lane. Kenseth is off 2nd. William Byron, Clint Bowyer and six others remained on the track. Green, Clint Bowyer drives it deep on the outside lane. Bowyer is clear of Byron off turn one. Byron fades quickly. Lap 110, Matt Kenseth is moving to the front. He just moved by Byron to take over 8th. 41 to go, Kyle Busch has a tire going down. He heads to the pit lane. He can make it on fuel from here. Busch was 16th. 32 to go, Clint Bowyer pits from the lead. Denny Hamlin pitted the lap before. Hamlin will cycle to the lead when the field pits. 22 to go, Clint Bowyer is running Denny Hamlin down. He leads him by seven car lengths. 17 to go, the caution is out for debris. There’s a piece of aluminum on the front stretch. Green, Hamlin leads. He’s clear of Bowyer just beyond the flag stand. Jamie McMurray is all over Bowyer. They make contact! McMurray lifts as Bowyer saves the car. 10 to go, Hamlin leads Bowyer by a full second. They’re both driving away from McMurray. 9 to go, Austin Dillon is in the wall. He got loose under Logano and made contact a few laps earlier. Dillon has a flat right front, no caution. Brad Keselowski has climbed to 3rd. He’s got fresh tires but needs a caution. 7 to go, big crash at the back! Jeffrey Earnhardt got loose under Landon Cassill. He skated up the banking and collected Cassill. Both cars made heavy contact with the wall, the caution is out. This will be a long cleanup. It’s going to setup a short shootout. That’s exactly what Keselowski needed. Green, Bowyer spins the tires! Hamlin leads Keselowski into turn one. Hamlin leads by 5 car lengths down the back stretch. 2 to go, Keselowski has closed to a car length as they cross the start finish line. Keselowski is all over the back bumper in turn one. Hamlin gets loose off turn two. Keselowski looks to the inside down the back. They touch and trade side drafts! Hamlin noses ahead on the outside lane into turn three. They run side by side off turn four. Keselowski gets into his door off the corner. keselowski noses ahead at the line as Hamlin gets passed by Erik Jones as well. 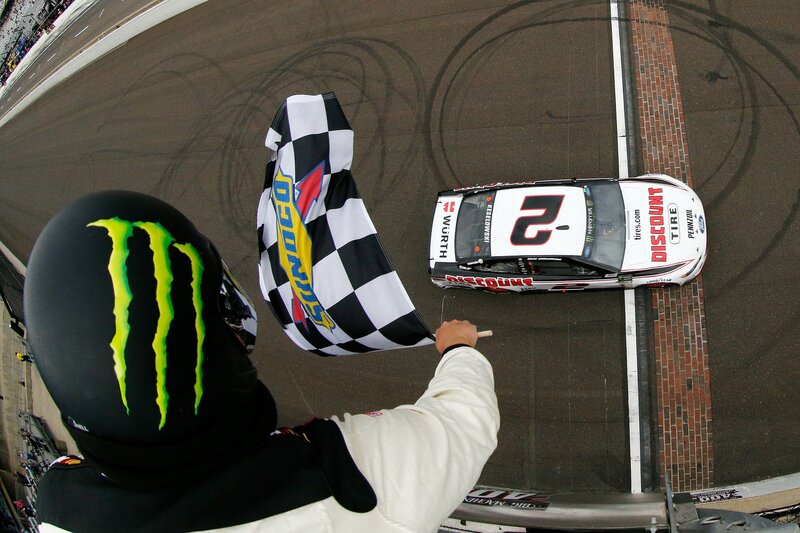 Brad Keselowski takes the win at Indianapolis Motor Speedway! 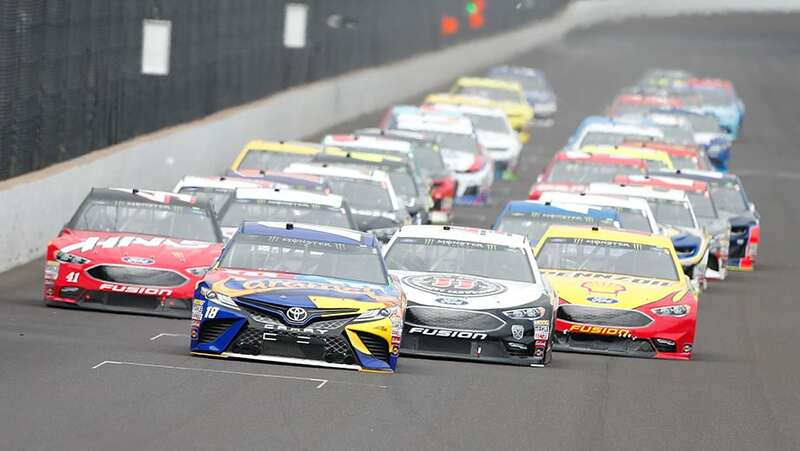 View full 2018 Indianapolis NASCAR race results below. 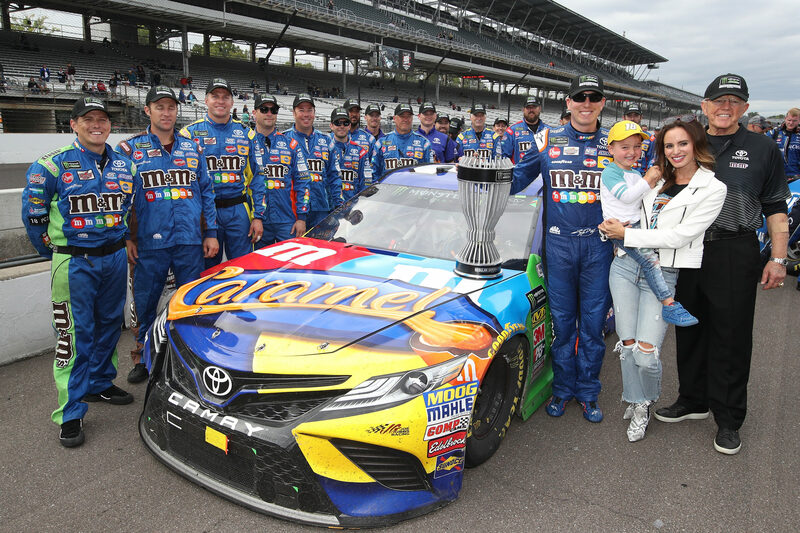 Kyle Busch has been crowned the 2018 regular season NASCAR cup Series champion!